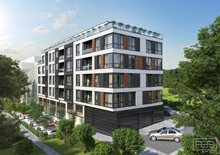 Buy in Bulgaria is presenting you with the possibility to buy a two bedroom apartment in a new building, located in the sea town of Byala, only 150 m from the wide, sandy beach. The building has five floors and is equipped with a lift. The building has an outdoor parking bay and a swimming pool. The apartment, offered for sale is located on the fourth floor and has a total area of 96 sq.m. The disposition of the premises is as follows: entrance hall, spacious living room with a kitchenette and an access to the panoramic balcony, two bedrooms, fully fitted bathroom. The property is offered with modern furniture and appliances. The kitchen area is 4 m long with a bar area and includes a refrigerator, dishwasher, oven, hot plates, aspirator. All premises are air conditioned. Large, 4 meters folding door leads to the panoramic balcony. The sea town of Byala is located on the border between Varna and Burgas districts, and lies at equal distances from both district centers. The nearest town is the town of Obzor, famous for its wide, sandy beaches.